Max Conrad (Agriculture, ’61), professor of landscape architecture at LSU for over 50 years, was named a Most Admired Educator of 2018-19 by DesignIntelligencemagazine. Earlier this year, Conrad made an endowed planned gift for the Robert S. Reich Memorial Graduate Assistantship Fund within the LSU Robert Reich School of Landscape Architecture. “This was a big surprise to me, and I want to thank all who made this honor possible,” Conrad said. Each year, DesignIntelligence, the leading journal of design professionals, honors excellence in architecture and design education. In addition to Conrad’s recognition, the 2018–19 America’s Best Architecture & Design Schools issue also ranked the school’s undergraduate program as number one in the nation and the graduate program as number five in the nation. His enthusiasm and commitment are evident in his establishment of the Robert S. Reich Memorial Graduate Assistantship Fund, which provides funding for a graduate assistant in landscape architecture in perpetuity. Conrad believes contributions to the fund will help the school recruit top-notch graduate students through financial support. Instead of withdrawing his IRA required minimum distribution, Conrad leveraged the charitable rollover option to contribute to the fund. He encourages those eligible to join him in continuing Reich’s legacy of excellence and supporting landscape architecture students. Conrad’s major interests are in the areas of urban design and regional planning. He is responsible for the studio field trips to the East and West coasts and eastern Canada, and he arranges student internships in Asia. 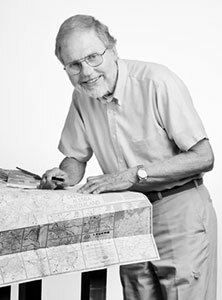 He was awarded the Charles Eliot Traveling Fellowship, making possible a round-the-world study tour, as well as the American Society of Landscape Architects’ 2013 Jot D. Carpenter Teaching Medal. LSU’s landscape architecture undergraduate program has been ranked in the top two in the nation for over a decade; the 2018–19 ranking is the ninth time the undergraduate program has held the number one position since 2006. The graduate program has also been ranked within the top six in the nation for over 10 years, sharing top rankings with Harvard, Cornell, the University of California, Berkeley and the University of Pennsylvania. LSU is by far the most affordable graduate program of the top five. You, like Conrad, can help us recruit top-notch students with a planned gift. Contact Julie Bolton Falgout, PhD, at jfalgout@lsufoundation.org or 225-578-5846 to get started.